Former Man United manager in line for Villans role. David Moyes chances of landing the vacant Aston Villa managers role appear to be on the rise, with his odds tumbling in recent days. Former Leicester boss Nigel Pearson remains the market leader to replace Remi Garde but a flurry of bets on former Everton, Manchester United and Real Sociedad gaffer have seen Moyes emerge as a credible rival. The Scot was once deemed a 9/1 but a spate of bets forced the Ladbrokes trading floor to shave that price to 6/1 before sustained interest saw the odd shorten further still to 4/1. Moyes has added fire to the flames by suggesting he is ready to get back into management and sees the Villa Park role as an exciting opportunity. Moyes is looking to rebuild his reputation after a poor showing at Old Trafford and in Spain and has moved ahead of a host of rivals in the race for the Villa job. Ipswich Town manager Mick McCarthy (7/1) and Preston North End boss Simon Grayson (10/1) are also in the running, with Wales boss Chris Coleman 16/1 to return to club management with the Midlands-based club. Villa are already consigned to relegation to the Championship but the club can attempt to claw back some credibility when hosting Southampton at Villa Park this weekend. The Villans go into that game as the 5/1 outsiders, with the draw available at 14/5 and a Saints win chalked up at 11/20. Click here to place your bets at Ladbrokes. 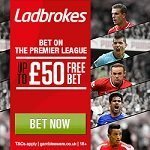 Get your free bet at Ladbrokes! Read about our Ladbrokes promo code here!